Tournaments, Simuls, and Chicken Biryani! Ladies & Gents – we’ve got some exciting news of a few fantastic London-based chess events to share. First up, our friends at Battersea Chess Club have given us the opportunity to be amongst the first to register for a pair of events they will be holding in December. 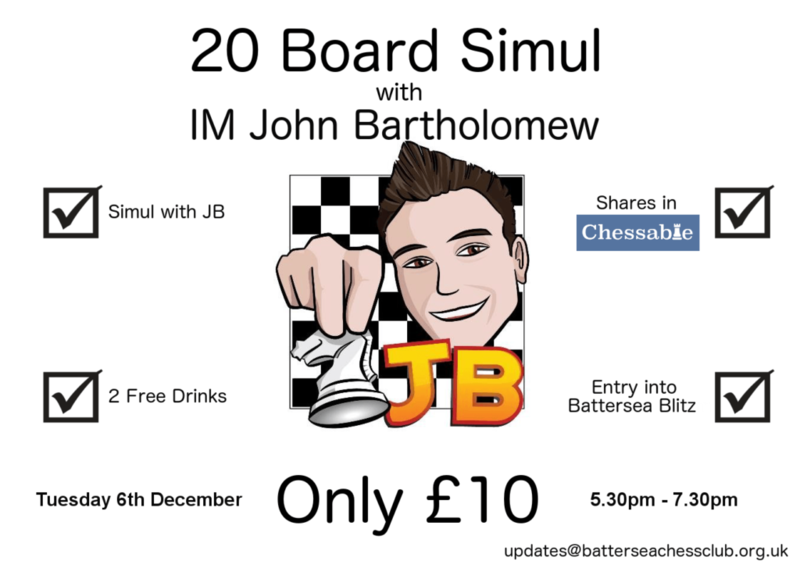 On Tuesday 6th December, they’ve a double-header – firstly, IM John Bartholomew will be playing a Simul against all-comers from 5.30 to 7.30pm. Full details can be found here, but in short – entry is £10 per player, which includes two free drinks from the bar at their venue, and free entry to their open Blitz tournament which starts immediately afterwards. The Blitz tourney will be run Swiss-style, with the first 60 entrants absolutely free, although if you’ve already paid up for the Simul your entry is guaranteed to be free no matter how many people play. It starts at 7.30pm sharp, with the winner taking all donations and a very fine trophy too! You don’t even need to be a club member – Can’t say fairer than that! 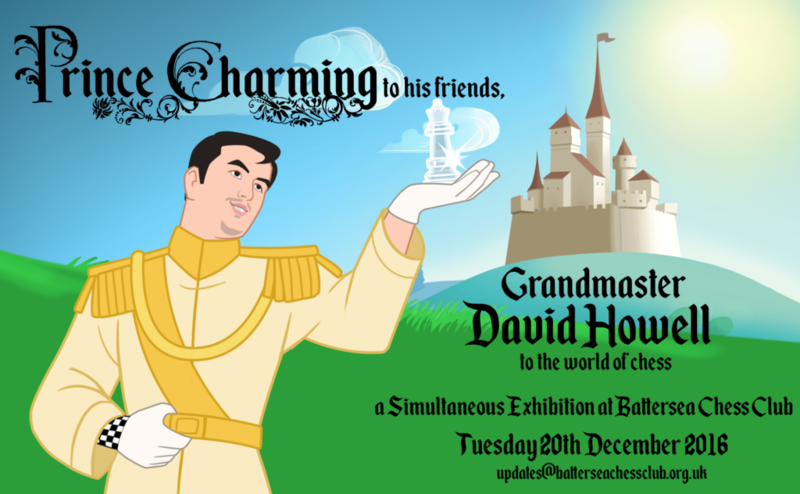 If that’s not enough, on Tuesday 20th December Battersea will be hosting former British Champion – the “Prince Charming” of Chess – GM David Howell for a Simultaneous exhibition. With a FIDE Rating of 2655, David is one of England’s strongest players. The Simul starts at 7.30pm, with entry £20 for non-members. Further details here. 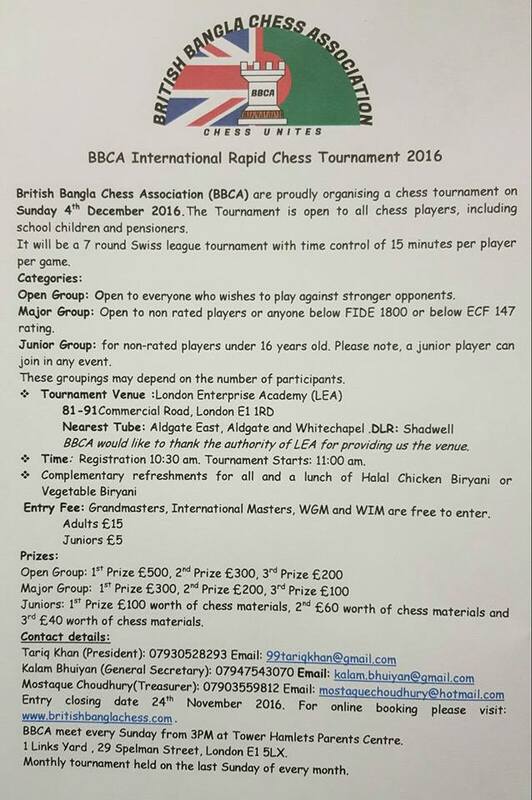 And last – but most certainly not least – our friends at the British Bangla Chess Association have informed us of an International Chess Tournament they are hosting at the London Enterprise Academy in Whitechapel (E1 1RD) on Sunday 4th December. Full details can be found on their Facebook page here, but broadly speaking it’s a 7-round Rapid play Swiss tourney with three different groupings depending on ability. Substantial cash prizes are on offer for placing, from £500 down to £40. Entry is £15 for adults, £5 for juniors, and the fee includes free refreshments throughout the day, along with a Biryani (chicken or veggie!) for lunch. Almost worth it for the food alone! Plenty of Chess to look forward to!! Next Next post: Middlesex League: A Harrow-ing Win!